In recent years there has been quite a renewed interest in the works of Belgium’s Alain Neffe and his Insane Music label, resulting in a 5LP for Vinyl On Demand, various 7”s for EE Tapes, a CD for Plinkity Plonk by Human Flesh. In all this curious revival one name from his past is absent and that is Cortex. 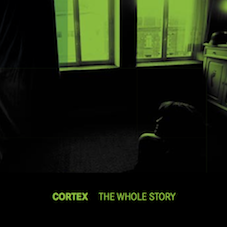 This omission is now corrected by the release of this double CD, which tells us the whole story of Cortex. This is perhaps Alain Neffe’s most personal project in which he plays music on synthesizers, rhythm boxes, sound effects and writes the lyrics, which can best seen as poetry. This poetry is recited by various women: Tina Scatozza, Nadina Bal (of Bene Gesserit), Isabelle Yernaux and Mirella Brunello. Intimate music with a personal character. Most of these pieces are in French. The pieces were released on a cassette for Insane Music Contact and a whole bunch of labels around the globe, such as The Cassette factory, Aerosol, 3rio Tapes, Grafika, Fraction Studio, Discograph, Stack Orientation, Beast 666, Trax, Music For Midget, Colin Potter, Finger In The Dike, Tear Apart Tapes, Korm Plastics, Innersleeve and Gut Level Music. Plus there are nine previously unreleased pieces, all remastered by Alain Neffe. This double CD comes in a plastic wallet with printed inserts and is released in an edition of 300 copies.